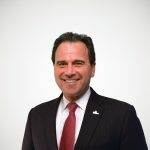 I am Scott Hodge, president of the Tax Foundation. Thank you for the opportunity to speak to you today about how comprehensive tax reform can boost America’s long-term economic growth and improve our global competitiveness. Founded in 1937, the Tax Foundation is the nation’s oldest non-partisan, non-profit organization dedicated to promoting economically sound tax policy at all levels of government. We are guided by the immutable principles of economically sound tax policy which say that: Taxes should be neutral to economic decision making, they should be simple, transparent, stable, and they should promote economic growth. In other words, the ideal tax system should do only one thing—raise a sufficient amount of revenues to fund government activities with the least amount of harm to the economy. By all accounts, the U.S. tax system is far from that ideal. The relentless growth of credits and deductions over the past 20 years has not only knocked half of all American households off the tax rolls, it has made the IRS a super-agency, engaged in policies as unrelated as delivering welfare benefits to subsidizing the manufacture of energy efficient refrigerators. I would argue that were we starting from scratch, these would not be the functions we would want a tax collection agency to perform. Washington can actually do more for the American people by doing less. The solution lies in fundamental tax reform—as has been suggested by parties as diverse as Chairman Ryan and President Obama’s National Commission on Fiscal Responsibility and Reform, chaired by Erskine Bowles and Alan Simpson. As many studies have shown, Americans could be taxed at lower rates—and the government could raise the same amount of revenue—if the majority of tax expenditures were eliminated. 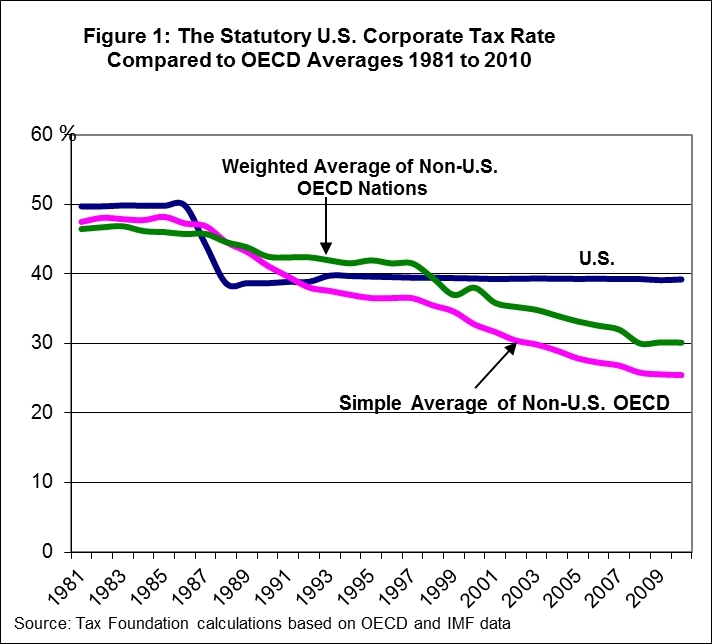 Path breaking research by economists at the OECD suggests that the U.S. corporate and individual tax systems are a major detriment to our nation’s long-term economic growth. In a major study analyzing the impact of various taxes on long-term economic growth, they determined that high corporate and personal income tax rates are the most harmful taxes for long-term economic growth, followed by consumption taxes and property taxes. Unfortunately, as many of you many know, the U.S. has the 2nd highest corporate income tax rate among industrialized nations and, this may surprise you, the U.S. has the most progressive personal income tax systems among industrialized nations. The economic evidence suggests that cutting our corporate and personal income tax rates while broadening the tax base would greatly improve the nation’s prospects for long-term GDP growth while helping to restore Uncle Sam’s fiscal health. More importantly, these measures will lead to higher wages and better living standards for American citizens. And that should be the number one priority of any tax policy. When it comes to corporate taxes, the U.S. has a Neiman Marcus tax system while the rest of the world has moved toward a Walmart model of corporate taxation. In contrast to our high-rate, narrow base, and worldwide model of corporate taxations, the basic tenets of this new model are lower tax rates, a broader base, and the exemption of foreign earnings. The U.S. remains far behind on both of these trends. Not only do we have the second-highest overall corporate tax rate among the leading industrialized nations at over 39 percent—only Japan has a higher overall rate—but we are one of the few remaining countries to tax on a worldwide basis. Our largest trading partners—Canada, Great Britain, and Japan—have already taken steps to make themselves more competitive. For example, Great Britain lowered its corporate tax rate on April 1st of this year, from 28 percent to 26 percent as a first step toward the goal of having a 23 percent rate in 2014. On January 1st, Canada lowered its federal corporate tax rate from 18 percent to 16.5 percent. Next year the rate will fall to 15 percent. Japan was scheduled to cut its overall corporate rate by 5 percent until the tragic earthquake derailed the government’s legislative agenda. Japan’s move would have left the U.S. with the highest overall corporate tax rate in the industrialized world. As important as are differences in tax rates, however, all three of these countries have effectively moved toward a territorial or exemption form of taxing the foreign profits of their multination firms. Indeed, of the 34 OECD member nations, 26 have either a full territorial system or exempt at least 95 percent of foreign earnings from repatriation taxes. The U.S. remains the only country in the OECD with a world-wide system and a corporate rate above 30 percent. However, these figures only account for U.S. income taxes paid on domestic profits and repatriated foreign earnings. When foreign taxes are included—U.S. corporations pay $100 billion annually in income taxes to other governments on their foreign profits—the overall tax rate on large multinationals is close to the U.S. statutory rate of 35 percent. 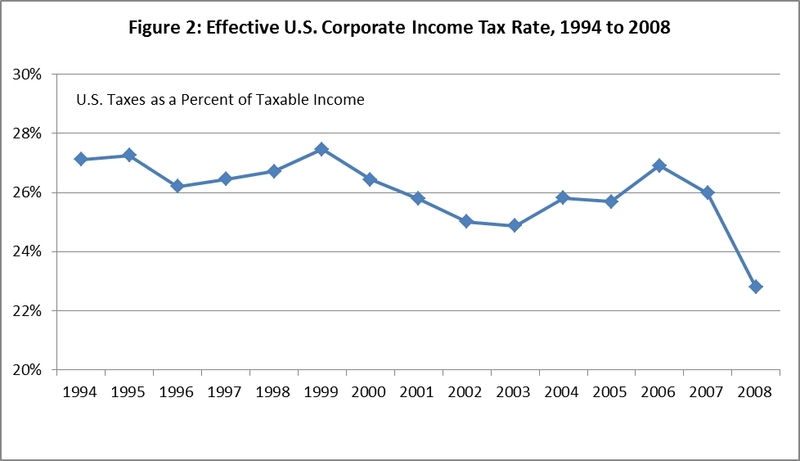 Averaged for all corporations, the overall effective corporate tax rate is between 32.1 and 33 percent. Cutting the U.S. corporate tax rate will help put the country on a long-term growth path. Economists at the OECD determined that the “corporate income tax is the most harmful tax for long-term economic growth” (emphasis added), not only because it increases the cost of domestic investment, but also because capital is the most mobile factor in the global economy, and thus the most sensitive to high tax rates. Indeed, the report found that “Corporate income taxes appear to have a particularly negative impact on GDP per capita.”  Lowering statutory corporate tax rates, they determined, “can lead to particularly large productivity gains in firms that are dynamic and profitable, i.e. those that can make the largest contribution to GDP growth.” OECD economists speculate that this could be because these are the firms that rely most heavily on retained earnings to finances their growth. Higher taxes mean fewer retained earnings, which means less growth. According to her model, a one percentage point increase in the average corporate tax rate decreases annual gross wages by 0.9 percent. Translated to U.S. corporate tax collections and wages, this means that a $10.4 billion increase in corporate tax collections would lower overall wages by $43.5 billion. A key factor for the health of the overall economy is the extent in which investment leads to new technology which, in turn, improves productivity. But, “high corporate taxes may reduce incentives for productivity-enhancing innovations by reducing their post-tax returns.” Thus, if U.S. lawmakers want to increase the amount of innovation in the country, a good first step would be to cut the corporate tax rate. Moving to a territorial system will eliminate the “lock-out” effect. A significant amount of economic research has shown that the willingness of multinational firms to bring home foreign profits is highly sensitive to the level of repatriation tax rates. A 2007 study by Foley et al., found that repatriation tax burdens induce firms to hold more cash abroad. They determined that “the median firm facing above average [repatriation] rates holds 47% of its cash abroad, but the median firm facing below average rates holds only 26% of its cash abroad. This figure suggests that repatriation tax burdens increase foreign cash holdings relative to domestic cash holdings.” It should be no surprise, thus, that by most accounts U.S. multinational firms are holding as much as $1 trillion in foreign earnings abroad, in part because of the high toll charge to bring the money back to the U.S. But in a finding that should particularly worry U.S. lawmakers, Foley et al. found that “technology intensive firms appear to be particularly sensitive to repatriation tax burdens,” as well as those with “strong growth opportunities,” and those with high levels of R&D expenditures. Thus, the “new economy” firms that contribute substantially to economic growth are those that are the most dissuaded from reinvesting their foreign profits back into the U.S.
What that means is that the top 10 percent of U.S. taxpayers pay a larger share of the income tax burden than do their counterparts in any other industrialized country, including traditionally “high-tax” countries such as France, Italy, and Sweden. Meanwhile, because of the generosity of such preferences as the EITC and child credit, low-income Americans have the lowest income tax burden of any OECD nation. With deference to Warren Buffett, the share of the income tax burden borne by America’s wealthiest taxpayers has been growing steadily for more than two decades. 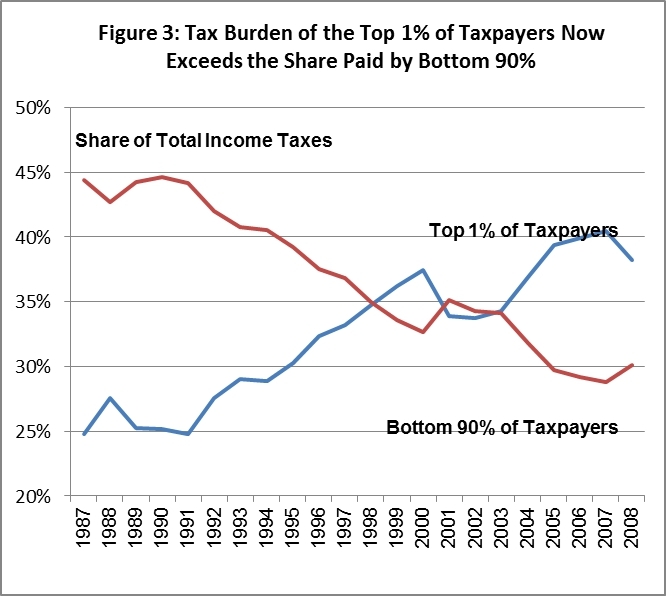 Figure 2 compares the share of income taxes paid by the top 1 percent of taxpayers to the share paid by the bottom 90 percent of taxpayers. What are the harmful effects of progressivity? The economic evidence is quite clear that there is a “non-trivial tradeoff between tax policies that enhance GDP per-capita and equity.” Meaning, the more we try to make an income tax system progressive, the more we undermine the factors that contribute most to economic growth—investment, risk taking, entrepreneurship, and productivity. Individual Tax Reform Must Go Hand-in-Hand with Corporate Reform. It may surprise people to learn that the corporate tax system is no longer the primary tool for which we tax businesses in America. 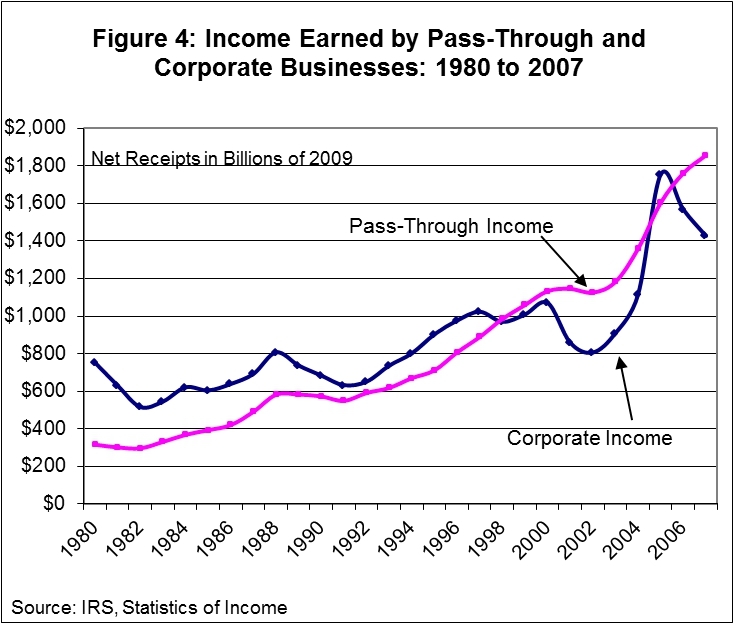 As Figure 4 below shows, more business income is currently taxed under the individual tax system than under the traditional corporate income tax system. It is also interesting to note that for the first time in the history of the tax code the top corporate tax rate and the top individual rate are the same (35 percent). These are key reasons why the individual and corporate tax systems should be reformed together. The neutrality principle dictates that the tax code not bias the way corporate and non-corporate businesses are taxed. There has been a tremendous growth in “flow-through” private businesses such as sole proprietors, S-corporations, LLCs, and partnerships over the past thirty years. Between 1980 and 2007, for example, the number of sole proprietors grew from 8.9 million to more than 23 million, and the number of S-corporations and partnerships (which include LLCs) grew at a faster rate from 1.9 million to more than 7 million. There are now three and one-half times as many pass-through firms as traditional C-corporations. America’s “rich” are our successful entrepreneurs and business owners. While some people dismiss the effect of high tax rates on business by citing the fact that only 2 or 3 percent of business owners pay tax in the top two brackets, the more economically relevant question is how much business income is earned by those in the top tax brackets. 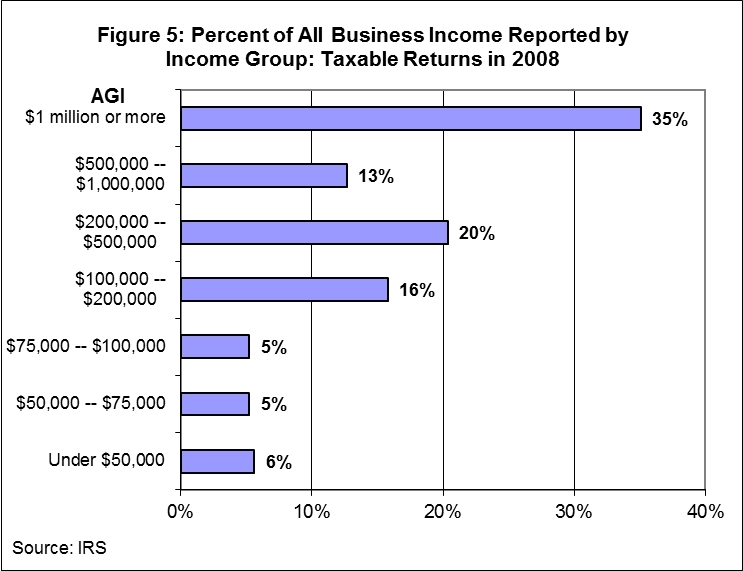 While there are millions of small businesses in America, Figure 5 shows that only about 16 percent of all private business income is earned by taxpayers with adjusted gross income (AGI) below $100,000. Another 16 percent of private business income is earned by taxpayers with AGI between $100,000 and $200,000. However, fully 68 percent of private business income is earned by taxpayers with AGI above $200,000—the target range of President Obama’s proposed tax rate increases. Some 35 percent of all private business income is earned by taxpayers with AGIs above $1 million. Another way of looking at the distribution of business income is to see how many taxpayers at the highest tax brackets have business income. According to Tax Policy Center estimates, more than 74 percent of tax filers in the highest tax bracket report business income, compare to 20 percent of those at the lowest bracket. As Table 1 below indicates, more than 40 percent of private business income is earned by taxpayers paying the top marginal rate. Source: Urban-Brookings Tax Policy Center Microsimulation Model (version 0509-5). With our large entrepreneurial and non-corporate sector, such studies suggest that the U.S. could see substantial productivity and GDP gains from lower personal income tax rates. Tax reform will also reduce complexity and dead-weight costs to the economy. In its 2010 Annual Report to Congress, the National Taxpayer Advocate identified tax complexity as the most serious problem facing taxpayers and the IRS, and urged lawmakers to simplify the system. It is estimated that tax compliance costs taxpayers an estimate $163 billion each year. The corporate tax system alone costs American businesses about $40 billion per year—roughly equal to the cost of hiring 800,000 workers at $50,000 each. One of the other ways that tax reform can lead to greater economic growth is by liberating taxpayers, businesses, and investors from these burdensome compliance and deadweight costs. The U.S. tax system is in desperate need of simplification and reform. To be sure, with the deficit now topping $1.5 trillion, many lawmakers may look at eliminating tax “loopholes” and simplifying the tax code as an opportunity to raise more revenues. But increasing the share of the economy going to tax collections should not be the primary goal of tax reform. The primary goal should be to promote long-term economic growth and better living standards for the American people. If the byproduct of increased economic growth is more tax revenues, then that is a win-win. But there is a real tension in the U.S. between the desire for a simpler tax code and one that insures fairness and equity. To be sure, tax reform that broadens the base while lowering marginal tax rates could create the appearance of giving “tax cuts for the rich,” an anathema to many. • An equitable tax system should be free of most credits or deductions and not micromanage individual or business behavior. • An equitable tax system should apply a single, flat rate on most everyone equally. That way, every citizen pays at least something toward the basic cost of government. • An equitable tax code should be simple—which would save all of us time, money and headache and would save the economy the deadweight loss of the current system. • An equitable tax code should have dramatically lower rates than we have today—in the mid-20s by most accounts—and the government could still raise the same amount of revenues. I believe that such a tax code would actually generate a more predictable and stable revenue stream to fund government programs as opposed to the roller coaster revenues we have today. Thank you, I’m happy to answer any questions you may have. Tax Policy Reform and Economic Growth, OECD Tax Policy Studies, No. 20, OECD Publishing (2010), p. 138. This is the year the top corporate tax rate was raised from 34 percent to 35 percent. William McBride, “Beyond the Headlines: What Do Corporations Pay in Income Tax?” Tax Foundation Special Report No. 194, September 2011, p. 2. Tax Policy Reform and Economic Growth, OECD Tax Policy Studies, No. 20, OECD Publishing (2010), p. 135. R. Alison Felix, “Passing the Burden: Corporate Tax Incidence in Open Economies,” October 2007, p. 2. Jens Arnold and Cyrille Schwellnus, “Do Corporate Taxes Reduce Productivity and Investment at the Firm Level? Cross-Country Evidence for the Amadeus Dataset,” CEPII, Working Paper No. 2008 – 19, September 2008, p. 31. The concept of “success taxes” was first suggested by Gentry and Hubbard (2004). Arnold and Schwellnus, p. 4. C. Fritz Foley, Jay C. Hartzell, Sheridan Titman, Garry Twite, “Why Do Firms Hold So Much Cash? A Tax-Based Explanation,” February 2007, p. 3. Tax Policy Reform and Economic Growth, p. 22. Scott A. Hodge, “Over One-Third of New Tax Revenue Would Come from Business Income if High-Income Personal Tax Cuts Expire,” Tax Foundation Special Report No. 185, September 2010, p. 4.